The stage has a winding and undulating profile. The first half features minor climbs and mild descents along the northern coast. The last ascent is the 5km San Pantaleo climb (topping out at 8 percent). 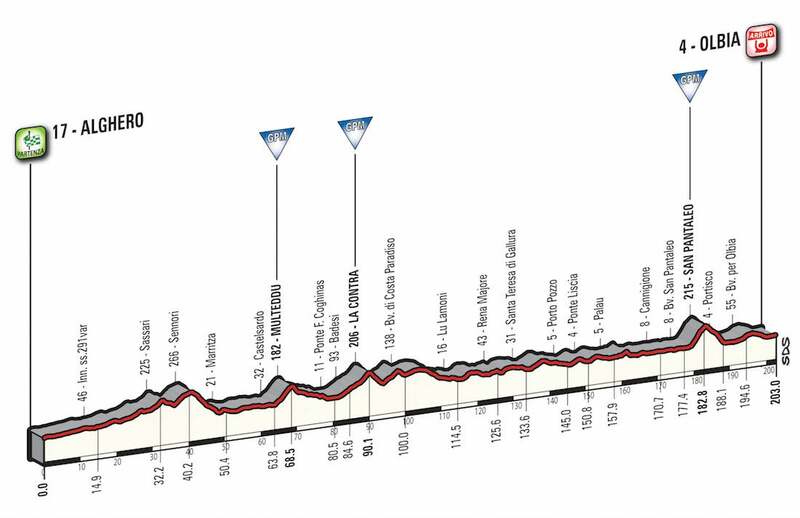 The final part until Olbia is also characterized by a constant undulation, where a sprint victory is to be expected. With a late attack on a technical finish into Olbia, Lukas Pöstlberger snuck away from the peloton and soloed to victory in stage 1 of the Giro d’Italia on the island of Sardinia Friday. Bora-Hansgrohe’s Austrian will wear the 100th Giro’s first pink jersey after fending off the sprinters. Orica-Scott’s Caleb Ewan had to settle for second place, ahead of Lotto-Soudal’s André Greipel who was third. The early break contained six riders: Mirco Maestri (Bardiani-CSF), Cesare Benedetti (Bora-Hansgrohe), Marcin Bialoblocki (CCC Sprandi Polkowice), Pavel Brutt (Gazprom-Rusvelo), Daniel Teklehaimanot (Dimension Data), and Eugert Zhupa (Wilier Selle Italia). Maestri was first to be dropped in the 206km stage, and as the peloton ramped up for the sprint, Bialoblocki also went back to the bunch. The peloton caught the remaining four men inside of the final five kilometers. After a sharp right-hand bend caused chaos with 3km to go, the field split with a small group vying for the sprint at the front. Pöstlberger, 25, drove the pace and got a gap over two Orica-Scott riders after a sharp corner with about 1.8km to go. The Austrian, in his grand tour debut, checked the gap and then put his head down to make the solo move stick. He held off a desperate chasing pack to claim an unexpected victory and the overall lead. Saturday’s second stage will offer a hillier route with two categorized climbs on the 221km route from Olbia to Tortoli in Sardinia. With a downhill run to the finish, Pöstlberger may be able to hold the overall lead, provided a breakaway doesn’t succeed.